We first came across Johnny Bodegas when he was a high profile Leader in SWA Ultimate. He later moved to UNO Premier, and recently started his own company, The Limitless. It’s exciting to see the transformation of a person from network marketing follower, to Leader, to business owner. It is a story of hope in the face of the unnerving certainty of change. Bodegas’ group owes no undying loyalty to any particular network marketing company. Instead, they owe their loyalty to self-development and the betterment of their fellow network marketers in the industry. Our eager anticipation is tempered by the prudent search for product reviews of what The Limitless has to offer. We’ve heard of some customers who have secured their position early, and will get in touch with them again once they’ve actually tried the products. Of course, there are marketing gurus who will share with you that it’s not really the product or the marketing plan which attracts customers. It’s YOU. And if you can teach others how to build their brand and attract people on the basis of their charismatic personality (or value-laden blog posts, articles, or video tutorials), then you stand a better chance of succeeding with the Get 4 Teach 4 Strategy that Johnny espouses. It is encouraging to hear in the video about the online and live training infrastructure that Johnny Bodegas and his team have prepared for the incoming members and distributors. We’re looking forward to seeing more Pinoy networkers upgrade their online marketing and email marketing skills, especially since they’ll be moving in the same circles as the husband-and-wife team of Jan and Aina Sacdalan. It is easy to foresee that people with an established network of supporters will go off to a raring start, and immediately bring in sales and referrals. As to how sustainable this will be will depend on the depth of their network, including their ability to inspire members to find 4 referrals and effectively teach others how to get their first 4 referrals also. 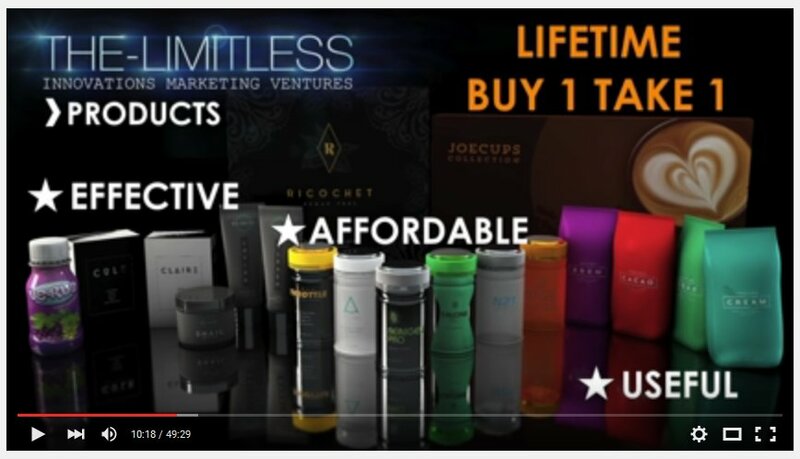 The Limitless offers an online webpage, a replicated website, and an online store. The key strategy is for members/distributors to spread the word and share the opportunity to as many people as they can, until they bring in 4 direct referrals. Once that goal is attained, the next focus is to help people find their first 4 direct referrals, and train others to also get 4. That’s how the cycle goes in the presentation of The Limitless. Can you imagine what will happen as an increasing number of members promote and share info about the Replicated Website? Yes, you’ll end up with competition. How will future customers choose who referral link to sign up under? For beginners, getting Facebook Marketing Training is optional because The Limitless has marketing tools that people can readily use. An example of this would be the Explainer or Presenter Video (hosted in YouTube), which allows you to tell your prospects: “Panuorin mo itong video…” and when the video helps close the sale, then you get the commission. Serious online entrepreneurs, on the other hand, will need to invest in an Email Autoresponder (around P1,500 per month) system and build their own list of supportive subscribers. They’ll also need to set a monthly budget for online advertising (P3,000 to P10,000 monthly). For the bold and courageous Pinoys who will embark on this journey, for those who dream of attaining Financial Freedom, we wish you success and all the best in your endeavors. Remember: Invest in yourself, before others will invest in you. Kasi sa totoo lang, Lamang Ang May Alam! This entry was posted in Online Marketing Training and tagged Achilles Mulles, Aina Sacdalan, Dax Alejandro, Jan Sacdalan, Johnny Bodegas, Mark Deximo, The Limitless by Manny Viloria. Bookmark the permalink.